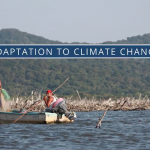 Mexico’s coastal wetlands are key for people’s adaptation to climate change . The project “Adaptation and Blue Carbon” is the first adaptation project funded by the national Climate Change Fund created by the General Law of Climate Change. The BMU-IKI project Mainstreaming EbA, implemented by GIZ, supports the communication of this success story.